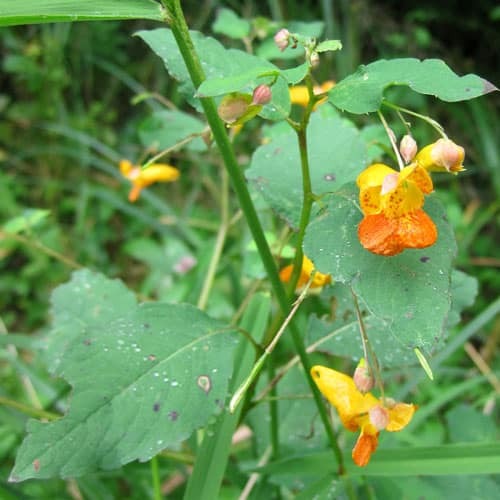 Today’s featured plant is Jewelweed, Impatiens capensis. Jewelweed is also known as touch-me-not, spotted touch-me-not, common jewelweed, spotted jewelweed, orange jewelweed and orange balsam. Jewelweed is an annual native, and can be found throughout most of the United States and Canada, except for the extreme north and some areas of the southwest and Rocky Mountains (see map). 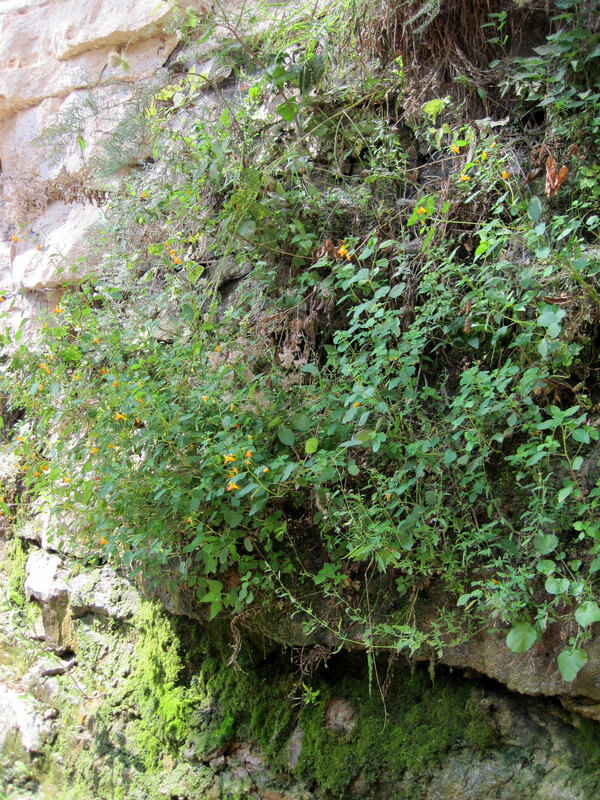 Jewelweed likes moisture and can be found along roadsides, streams, in wetlands and shady areas. We saw a fair amount of it when we went elderberry picking, as they like the same conditions. I also saw a big clump of it hanging on a rock wall in Fonferek Glen today, which I thought was interesting. Apparently, it tolerates poor soil – or even no soil. The flowers or the jewelweed are most distinctive – a striking, freckled flame-orange with a tubular shape. They are around 1″(2.5 cm) long. Not surprisingly, they are in important nectar source for hummingbirds. The name “touch-me-not” comes from the long, banana-shaped seed pods, which burst open when touched when they are ripe, spraying seeds in every direction. The ones we saw today were not quite ready just yet. The flowers attract the Ruby-Throated Hummingbird and long-tongued bees, including bumblebees and honeybees. Swallowtail butterflies are less common visitors. These visitors seek nectar; many long-tongued bees also collect pollen. Sometimes bumblebees will steal nectar by chewing holes near the spur of the flower. Various smaller insects (e.g., Syrphid flies) will visit the same holes to steal nectar. The caterpillars of several moths feed on the foliage, including Euchlaena obtusaria (Obtuse Euchlaena), Spilosoma latipennis (Pink-Legged Tiger Moth), Trichodezia albovittata (White-Striped Black), and Xanthorhoe lacustrata (Toothed Brown Carpet). Upland gamebirds eat the large seeds, including the Ruffed Grouse, Ring-Necked Pheasant, Greater Prairie Chicken, and Bobwhite Quail. Among mammals, White-Tailed Deer browse on the foliage, while the White-Footed Mouse eats the seeds. Sarah Becker of Wilkes University has a very detailed article titled “Medical Attributes of Impatiens sp. 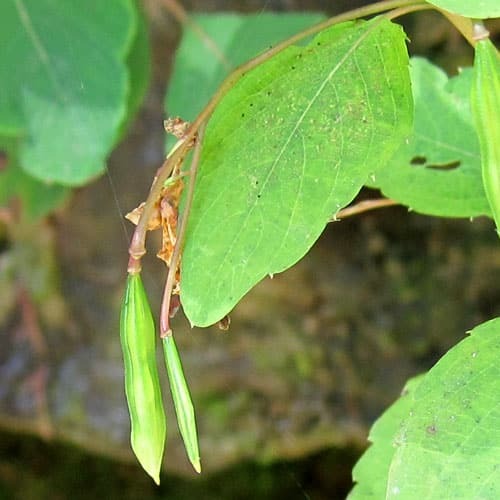 – Jewelweed, Touch-me-not“, in which she discusses the standard uses, as well as its potential as a cancer fighting agent and anti-fungal/anti-microbial. Jewelweed or an infusion made from boiling leaves of Impatiens capensis may be frozen for later use. Brew chopped jewelweed in boiling water until you get a dark orange liquid. 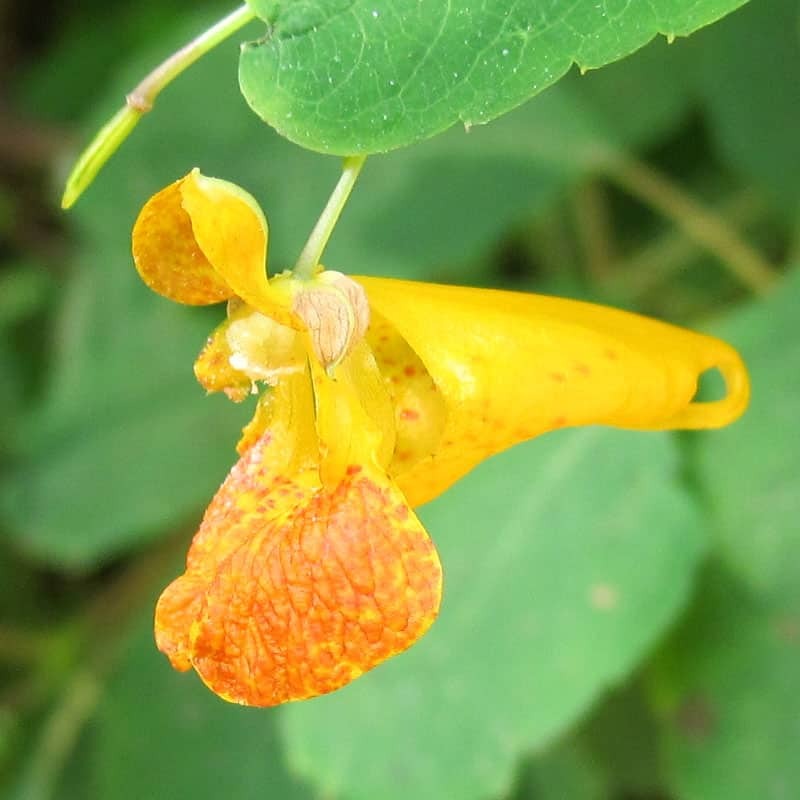 Yellow Jewelweed will not yield orange color and may not be effective. Strain the liquid and pour into ice cube trays. 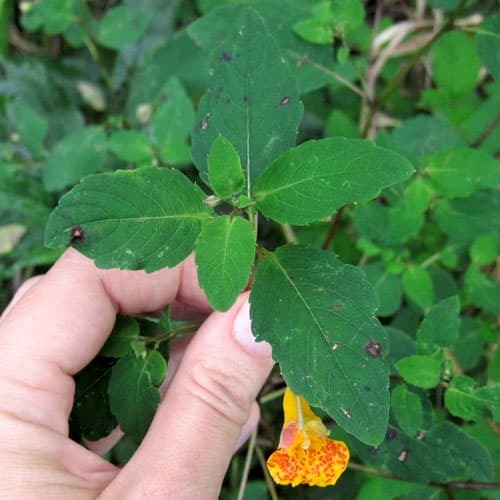 When you have a skin rash, rub it with a jewelweed cube and you will be amazed with its healing properties. It will keep in freezer up to a year. You can also preserve the infusion by canning it in a pressure cooker. My friend, Tami, who has two sons that juice a lot of jewelweed, says the medicinal properties are best before it flowers. Mountain Rose Herbs stocks many of the herbs and plants featured in the Weekly Weeder series. They also carry an assortment of bottles, droppers and other supplies, plus some really soft, reasonably priced, organic cotton t-shirts. Your purchase from them supports this site. I gardened for years before I thought to do anything more than get rid of weeds. I remember my grandmother talking about “medicine leaf” (https://commonsensehome.com/grandma-called-it-medicine-leaf/), but we never actually did anything with the leaves. Now, I know better, and my children know better. It’s interesting learning about so many useful plants.